This past week I was in Minneapolis, Minnesota. I was there for a few reasons. To visit with family. To see some friends. And to run/walk the Medtronic Twin Cities Marathon. Yes. Run/Walk. Am I ashamed of this? Not at all. This race was a warm-up. A warm up to the race I am running in 3 weeks exactly. And, as my training schedule was completely killed with my foot injury and then…orthodic problems…I went to Minneapolis not quite certain I’d be able to even run/walk the course. I figured, I could at least spend time with family. On Saturday morning, I was pretty certain the race was off. I went to the expo and hobbled through, getting my race number, buying new shoes, shopping, checking out the vendors and other races that were there…and the more time I was there, the more I wanted to do it. It also helped that my friend Heather was telling me I could do it. Walk the hills. Just walk the hills. And to help, she took me on the tour of the entire race course…and…yeah…I figured I could at least give it a go. While touring the course, my aunt, Jan, and my cousin, Molly, texted me to find out dinner plans. They know that the night before the race is gluten-free pizza night. And to avoid that horrible mistake that was Pizza Ranch last time I raced in Minneapolis, Cathy did some research before we left. 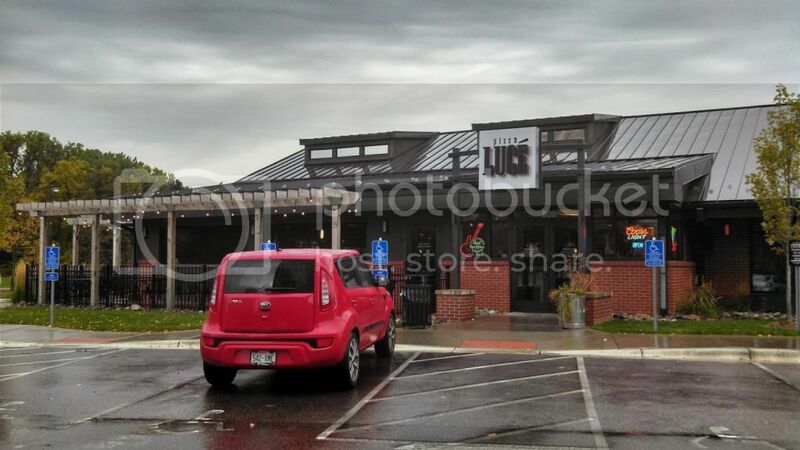 I heard only good things about Pizza Lucé, both on Find Me Gluten Free and in regular reviews. In fact, they are touted as “The Best Pizza In Minneapolis.” So…that had to be good right. We hadn’t thought of reservations, but as there was going to be at least 11 of us there…Molly went ahead and got that arranged. That evening, at 5 p.m., we showed up at Pizza Lucé on West 66th Street in Richfield, Minnesota. My cousins, their significant others, and the children were all there. My aunt was the last to arrive. But there we were…me, my roomie, my bestie, my family…ready to give this place a try. I don’t think the Pizza Ranch experience will ever be forgotten. We joke about it even now. All of us who endured it. But, as this place had not only gluten-free, but also vegan options…I was already feeling good about it. We were seated and our drink orders were taken while we looked over the menu. Heather was onboard with splittling with Cathy and I up until I said I needed the vegan cheese. Then, Cathy left it to me to choose what pizza to do (or build our own, which is an option). I was actually torn between a seasonal special or one of the signature pizzas on the menu. I was going back and forth and when I mentioned the Curried Coconut Butternut Squash Pizza (roasted butternut squash whipped with curry and coconut milk and finished with fresh red bell pepper, feta cheese, red onion, pineapple and fresh cilantro) to Cathy, she seemed very unenthusiastic about it. 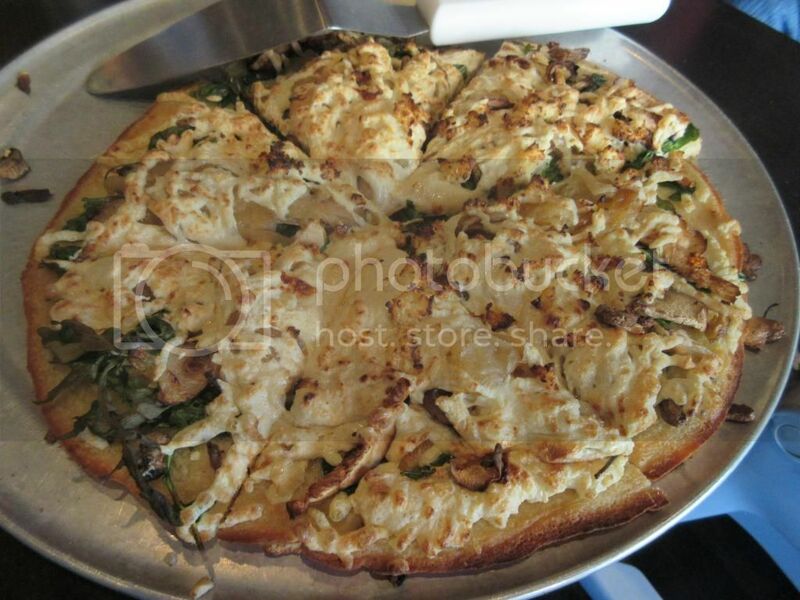 So, I decided to go with my other choice…the Wild Mushroom and Arugula Pizza ($18.89). While the various orders for each of us (some of us got pizzas, some got pastas)…we all sat around and talked about tons of things. My cousin Molly had a new baby girl that I hadn’t met yet…her two boys were entertaining on the other end of the table. My cousin, Andy, just got married and he and his wife were there…so we talked wedding. We talked running. We talked family. We talked about everything. Literally. And then…tasty food began arriving. The Gluten Free Wild Mushroom and Arugula Pizza was set down next to me – a fantastic 10 inch gluten-free crust that was topped off with olive oil, fresh basil, arugula, caramelized onion, garlic, a wild mushroom blend (cirimini, oyster, portabella, and shiitake) and Daiya cheese (vegan!). It looked AMAZING! I mean, my mouth immediately began to water. And it was then that we realized that Heather, Cathy and I totally forgot to grab lunch today. So, yeah…we were ready to dig in. I served 3 slices, half of the pizza, to Cathy and saved the other half for me. OH. MY. PIZZA. GOODNESS. This was creamy, crunchy and good! Beyond good. This pizza was so delicious. I love a good white pizza and this went above and beyond what I am used to. It was so creamy because they actually got the Daiya cheese to melt down to a perfect gooey texture. The blend of flavors was classic, with the arugula adding a hit of peppery flavor to the sweetness of the caramelized onion and the earthiness of the mushrooms. I might have devoured every single bit of it. Seriously. Like hoovered it all down. I was so happy with the food here I really considered going back. They, after all, also have a gluten-free stuffed shells on the menu. Pardon me while I drool! In a heartbeat…I would definitely return to Pizza Lucé in the future. This place beyond impressed me. And I think all of us who survived the disgusting nastiness of Pizza Ranch the year before were grateful to have delicious food and the variety of options that Pizza Lucé offered. If I had been there longer, I would have returned during the rest of my stay in Minneapolis. Seriously…so happy and can’t wait to go back next time I make it to Minneapolis! This entry was posted in Cheese, Dough, Entree, Food, Gluten-Free, Italian, Mushrooms, Pasta, Pizza, Restaurants, Review, Sauce, Vegan, Vegetables, Vegetarian by The Celiathlete. Bookmark the permalink.